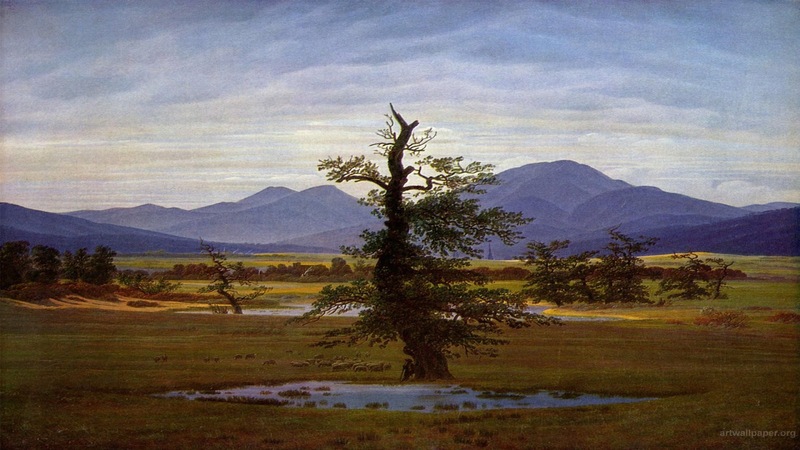 The German painter** Caspar David Friedrich (September 5, 1774 - May 7, 1840) was a landscape painter of the nineteenth-century German Romantic movement, of which he is now considered the most important painter. 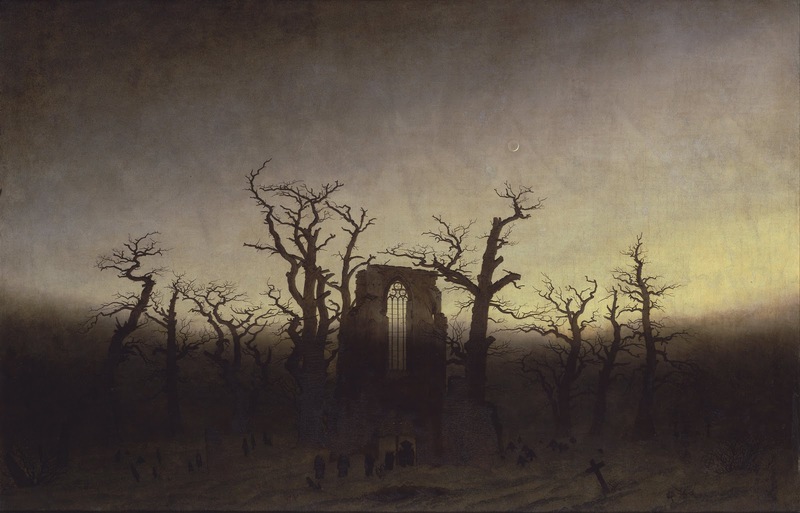 A painter and draughtsman, Friedrich is best known for his later allegorical landscapes, which feature contemplative figures silhouetted against night skies, morning mists, barren trees, and Gothic ruins. His primary interest as an artist was the contemplation of nature, and his often symbolic and anti-classical work seeks to convey the spiritual experiences of life. 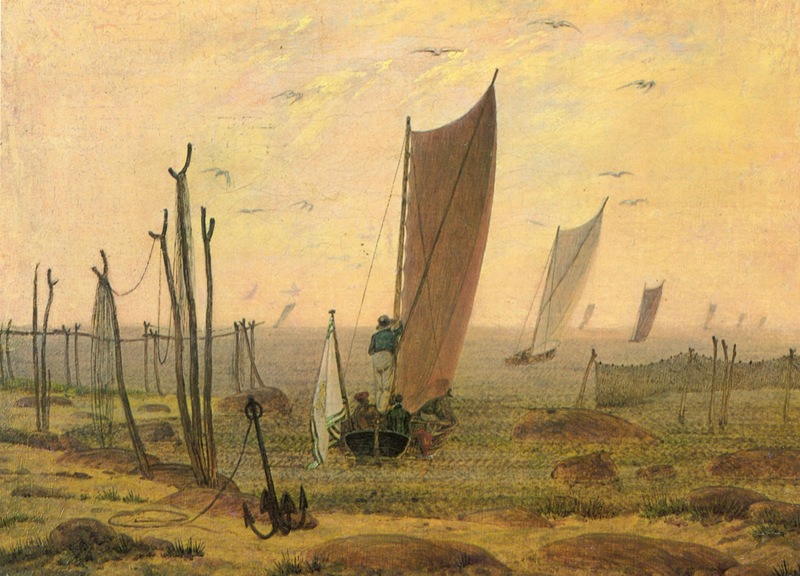 Friedrich was born in Greifswald in northern Germany in 1774. He studied in Copenhagen until 1798 before settling in Dresden. He came of age during a period when, across Europe, a growing disillusionment with an over-materialistic society led to a new appreciation for spiritualism. 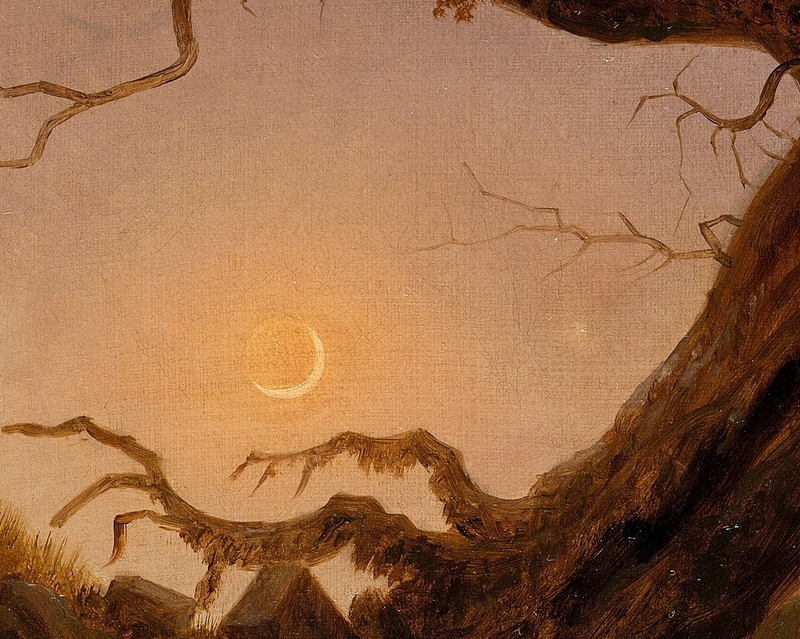 This was often expressed through a reevaluation of the natural world, as artists such as Friedrich, J. M. W. Turner and John Constable sought to depict nature as a "divine creation, to be set against the artifice of human civilization". 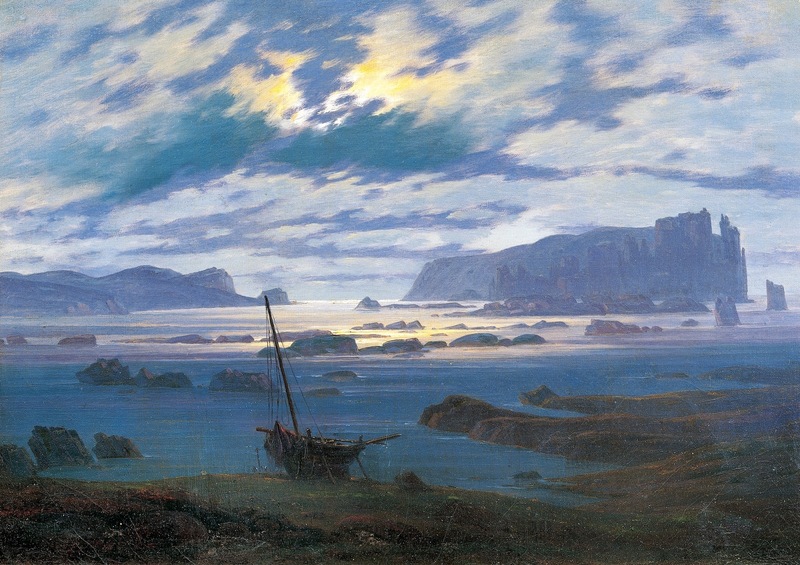 Although Friedrich was renowned during his lifetime, his work fell from favour during the second half of the nineteenth century. 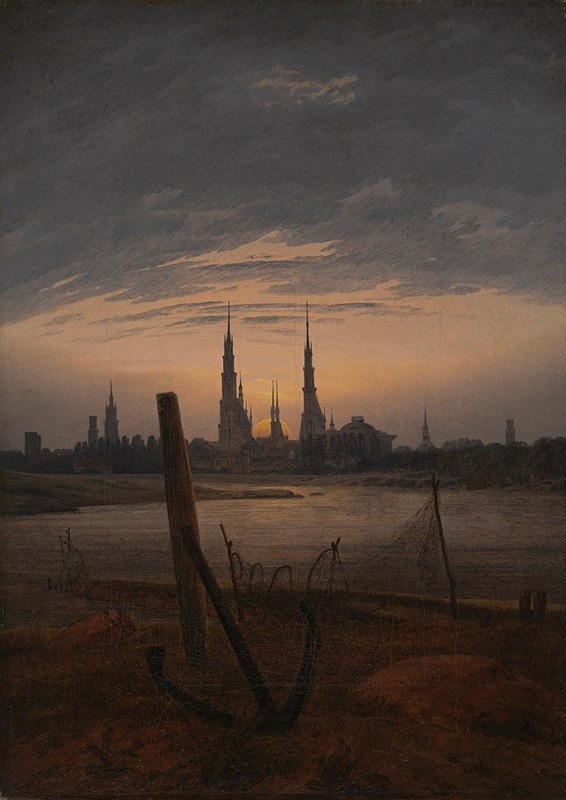 As Germany moved towards modernisation, a new urgency was brought to its art, and Friedrich's contemplative depictions of stillness were seen as the products of a bygone age. His rediscovery began in 1906 when an exhibition of 32 of his paintings and sculptures was held in Berlin. During the 1920s his work was appreciated by the Expressionists, and in the 1930s and 1940s, the Surrealists and Existentialists frequently drew on his work. Today he is seen as an icon of the German Romantic movement, and a painter of international importance. 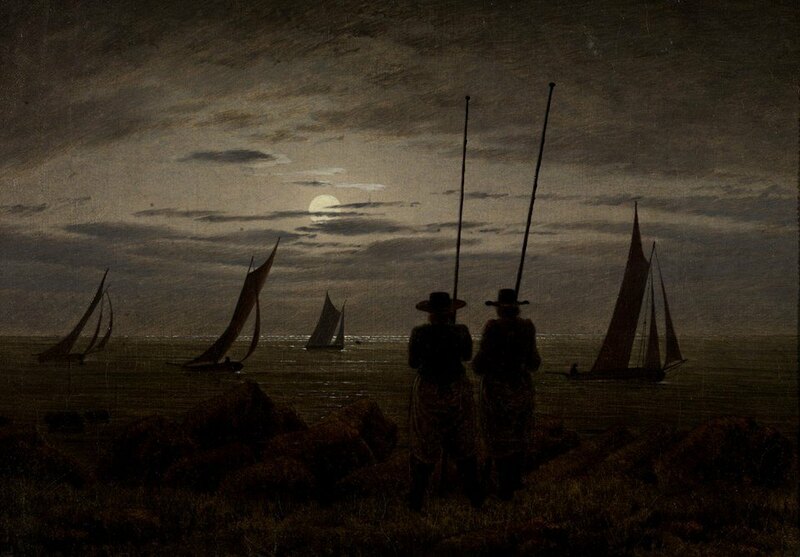 Caspar David Friedrich was born the sixth of ten children in Greifswald, Swedish Pomerania, on the Baltic Sea. He grew up under the strict Lutheran creed of his father Adolf Gottlieb, a prosperous candle-maker and soap boiler. Friedrich had an early familiarity with death: his mother, Sophie Dorothea Bechly, died in 1781 when Caspar David was just seven. At the age of thirteen, Caspar David witnessed his brother, Johann Christoffer, fall through the ice of a frozen lake and drown. Some accounts suggest that Johann Christoffer succumbed while trying to rescue Caspar David, who was also in danger on the ice. His sister Elisabeth died in 1782, while a second sister, Maria, succumbed to typhus in 1791. 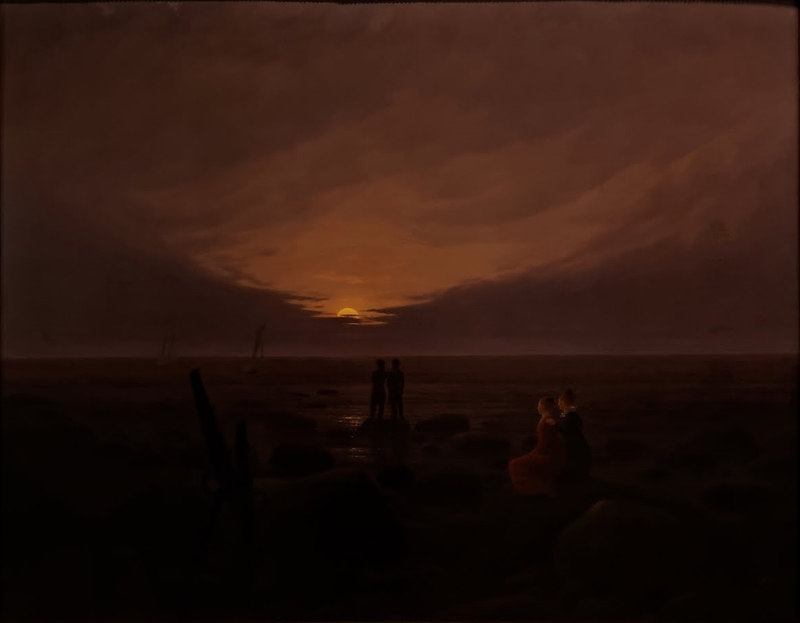 Some of Friedrich's contemporaries attributed the melancholy in his art to these childhood events, yet it is as likely that Friedrich's personality was naturally so inclined. 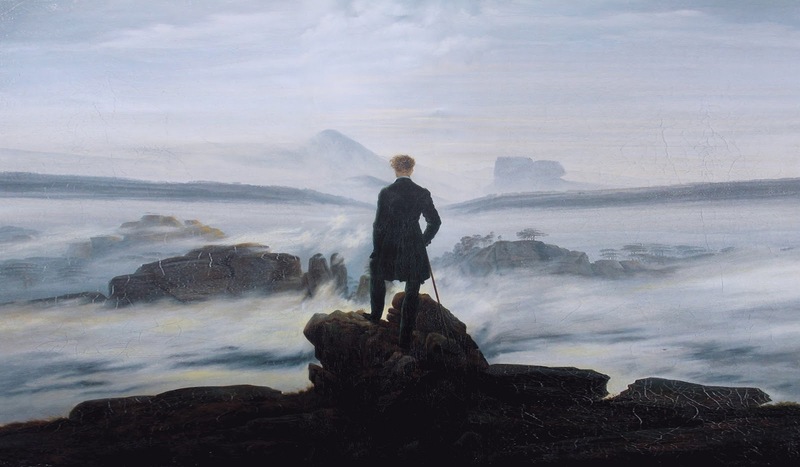 As an adult, the pale and withdrawn Friedrich reinforced the popular notion of the "taciturn man from the North". His letters, however, always contained humour and self-irony. "He was indeed a strange mixture of temperament, his moods ranging from the gravest seriousness to the gayest humour … But anyone who knew only this side of Friedrich's personality, namely his deep melancholic seriousness, only knew half the man. I have met few people who have such a gift for telling jokes and such a sense of fun as he did, providing that he was in the company of people he liked". 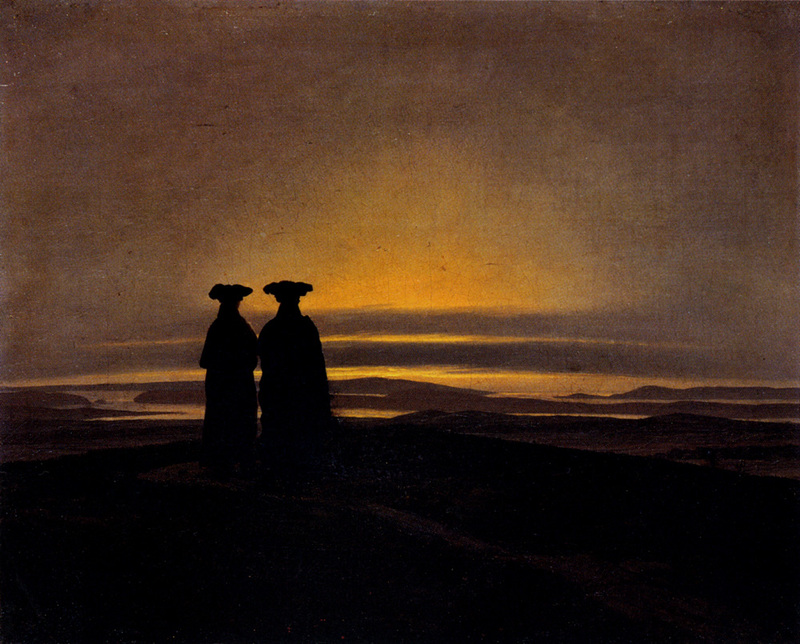 In 1790, Friedrich began to study art with Johann Gottfried Quistorp at the University of Greifswald, and literature and aesthetics with the Swedish professor Thomas Thorild. 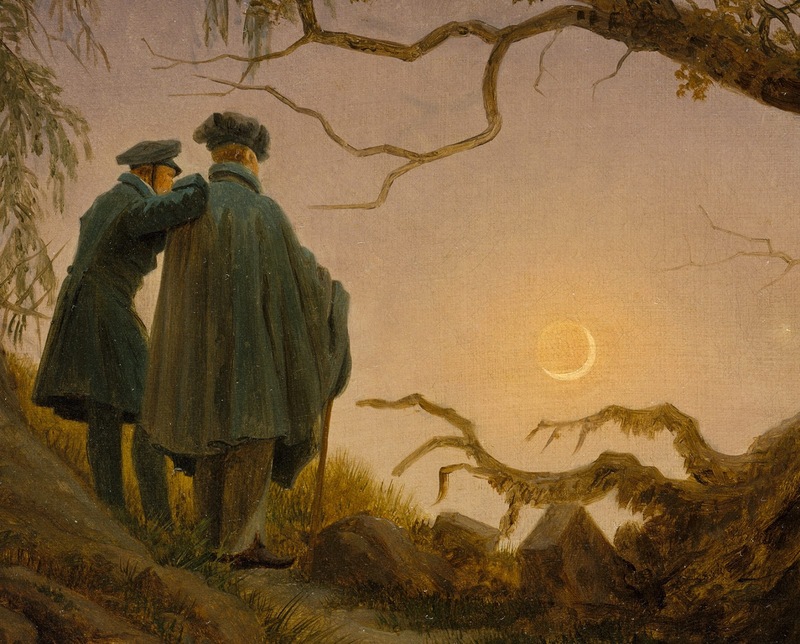 Thorild was interested in the contemporary English aesthetic, and taught Friedrich to distinguish between the spiritual 'inner eye' and the less favourable physical 'outer eye'. 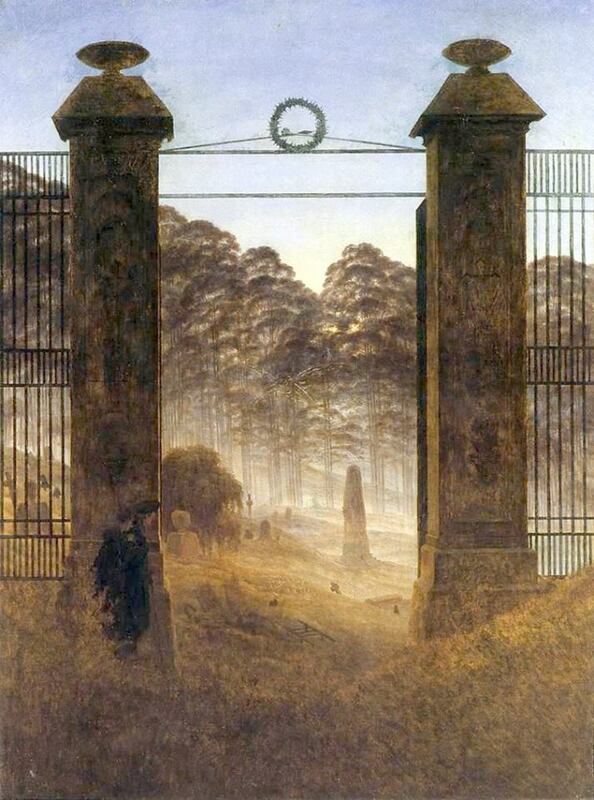 Friedrich entered the prestigious Academy of Copenhagen in 1794 where he studied under teachers such as Christian August Lorentzen and the landscape painter Jens Juel. These artists were inspired by the Sturm und Drang movement, and represented a midpoint between the dramatic intensity and expressive manner of the budding Romantic aesthetic and the by then waning neo-classical form. Mood was paramount, and influence was drawn from such sources as the Icelandic legend of Edda and Ossian, and Nordic folklore. A talented student, Friedrich began his education at the academy by making copies of casts from antique sculptures, before proceeding to drawing from life. He was keenly interested in seventeenth-century Dutch landscape painting, to which he had access at Copenhagen's Royal Picture Gallery. In 1798 he settled permanently in Dresden. He often drew works, mainly naturalistic and topographical, with India ink, watercolor and sepia ink. It is unclear when he finally took up oil painting, but it was probably after the age of thirty. 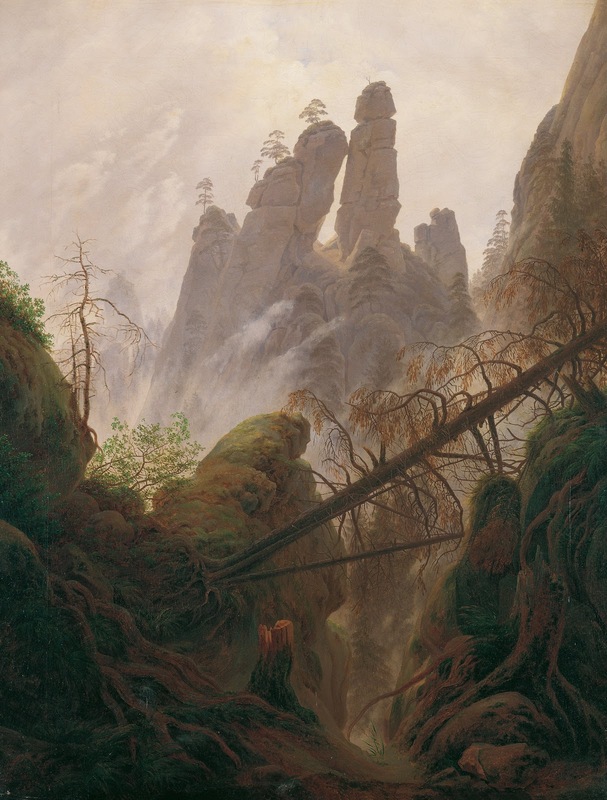 Landscapes were his preferred subject, inspired by frequent trips, beginning in 1801, to the Baltic coast, Bohemia, the Riesen Mountains and the Harz Mountains. Mostly based on the landscapes of northern Germany, his paintings depict woods, hills, harbors, morning mists and other light effects based on a close observation of nature. The paintings of this time were modeled on sketches and studies of scenic spots, like the cliffs on Rügen, and the surroundings of Dresden or Elbe. 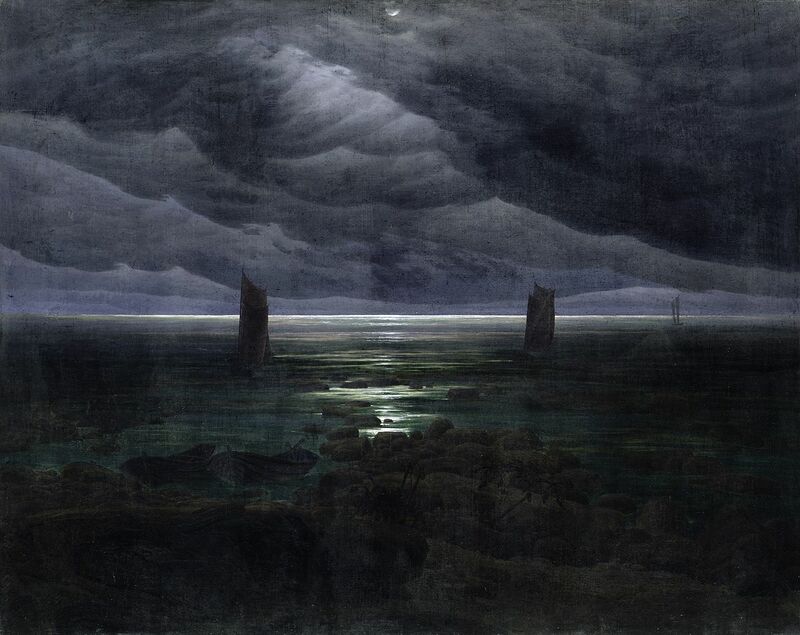 The studies themselves were made almost exclusively in pencil, and provided topographical information; the subtle atmospheric effects characteristic of Friedrich's maturity were rendered from memory. 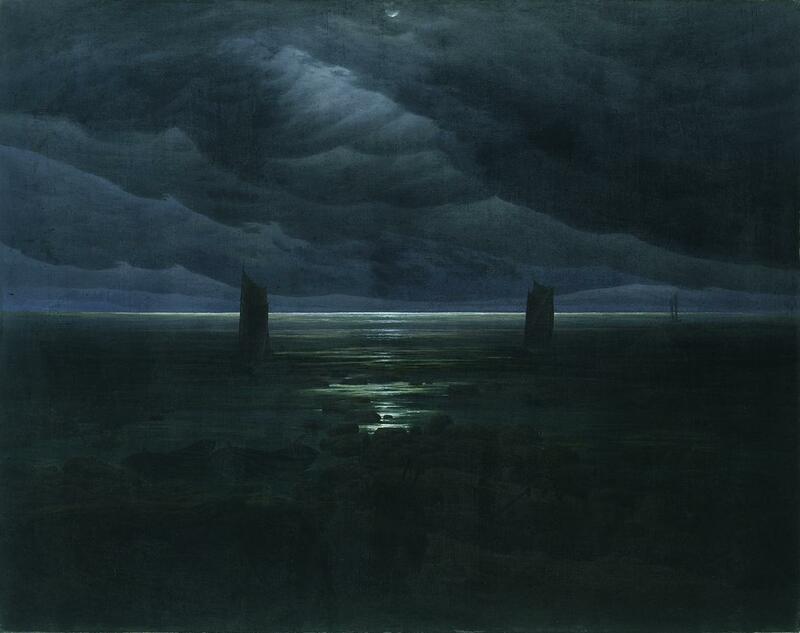 These effects would eventually be most concerned with the depiction of light, of the illumination of sun and moon on clouds and water, optical phenomena specific to the Baltic coast and that had never before been painted. 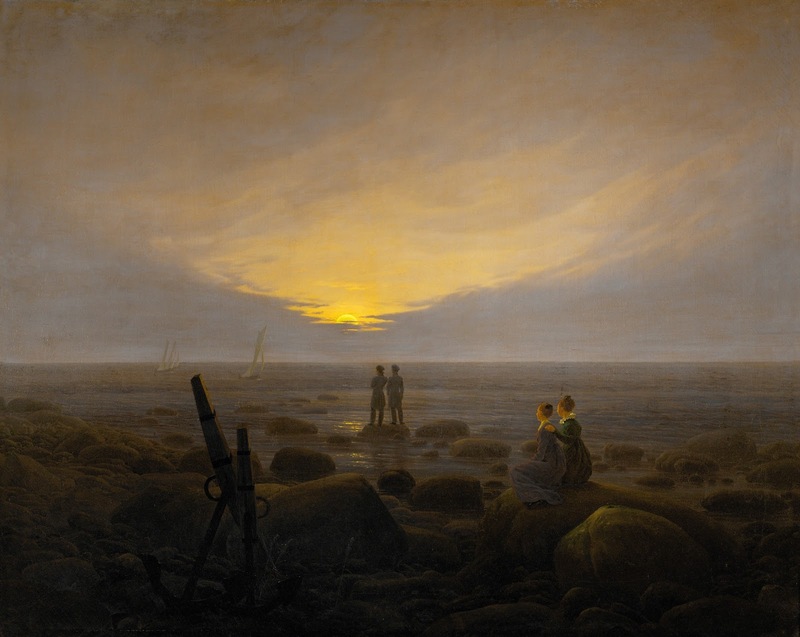 Friedrich's first major painting came at the age of 34. 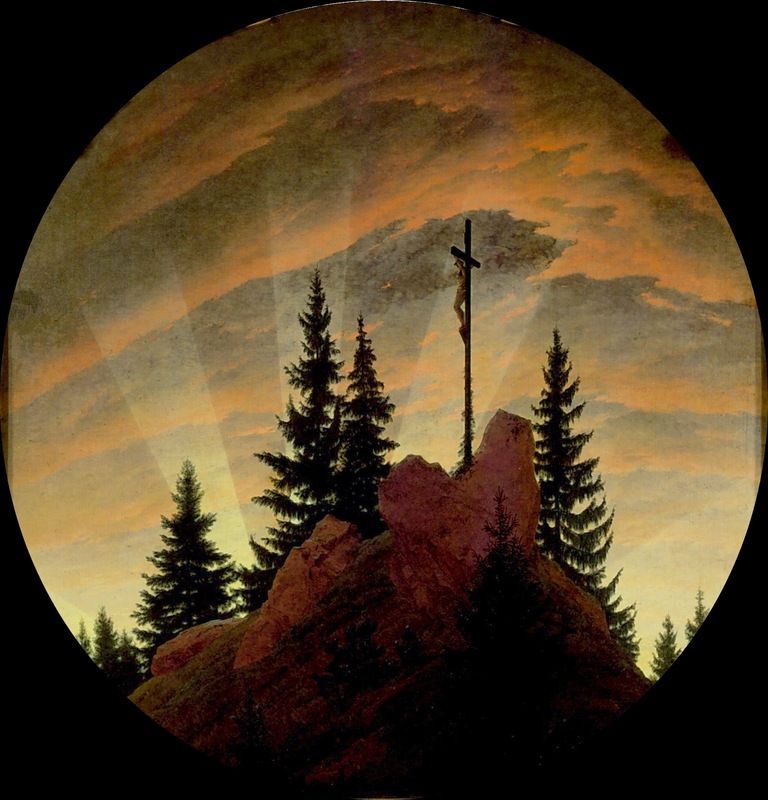 The Cross in the Mountains, now known as the The Tetschen Altar (Gemäldegalerie, Dresden), was an altarpiece panel exhibited in 1808. The work met with controversy, but it was his first painting to gain wide appraisal; for the first time in Christian art, a pure landscape was the panel of an altarpiece. 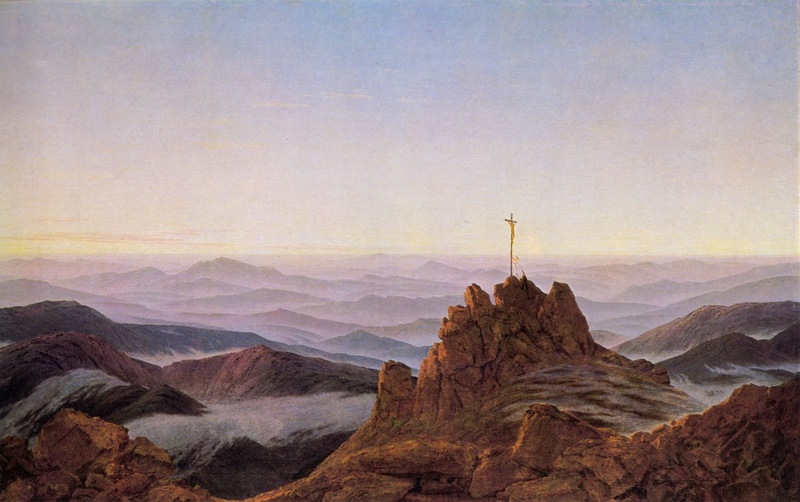 It depicts the crucified Christ in profile at the top of a mountain, alone, surrounded by nature. The cross rises highest in the composition, but is viewed obliquely and at a distance. The mountain symbolizes an immovable faith, while the fir trees represent hope. 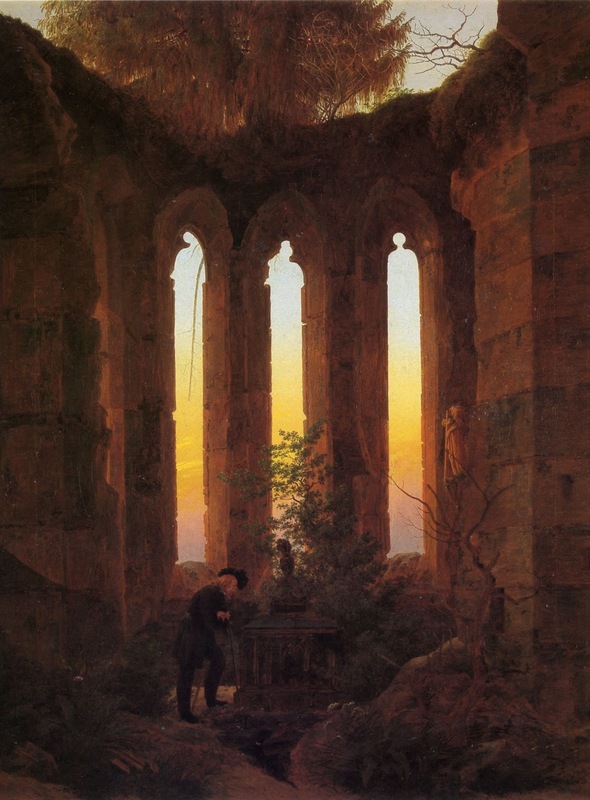 The artist and critic Basilius von Ramdohr published a lengthy article rejecting Friedrich's use of landscape in such a context; he wrote that it would be "a veritable presumption, if landscape painting were to sneak into the church and creep onto the altar". 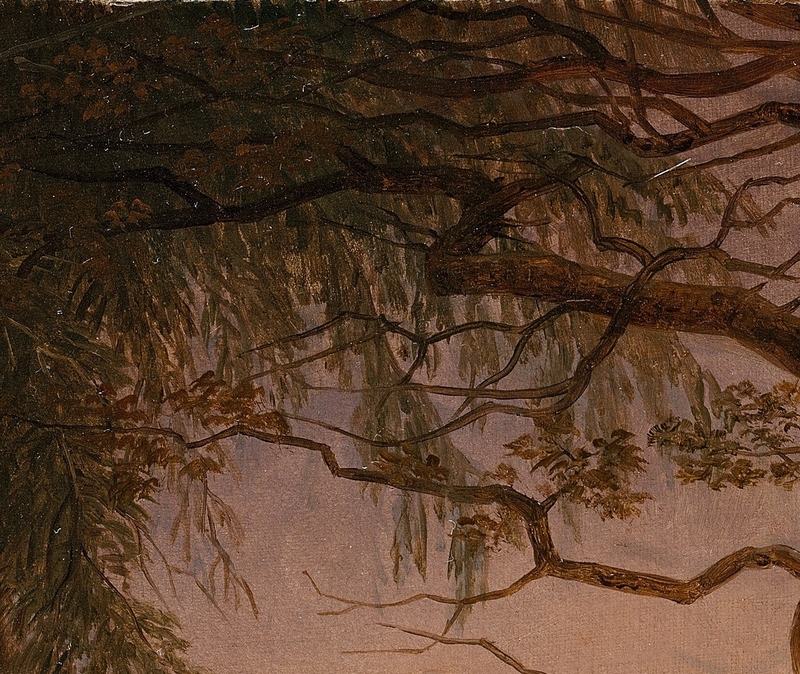 Rahmdohr was fundamentally asking whether a pure landscape painting could convey an explicit meaning. 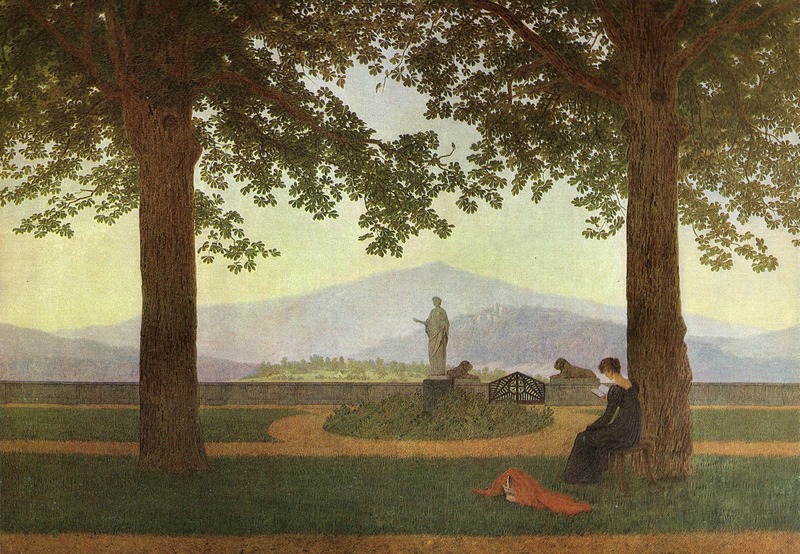 Friedrich's friends publicly defended him, and the artist wrote a programme providing his interpretation of the picture. 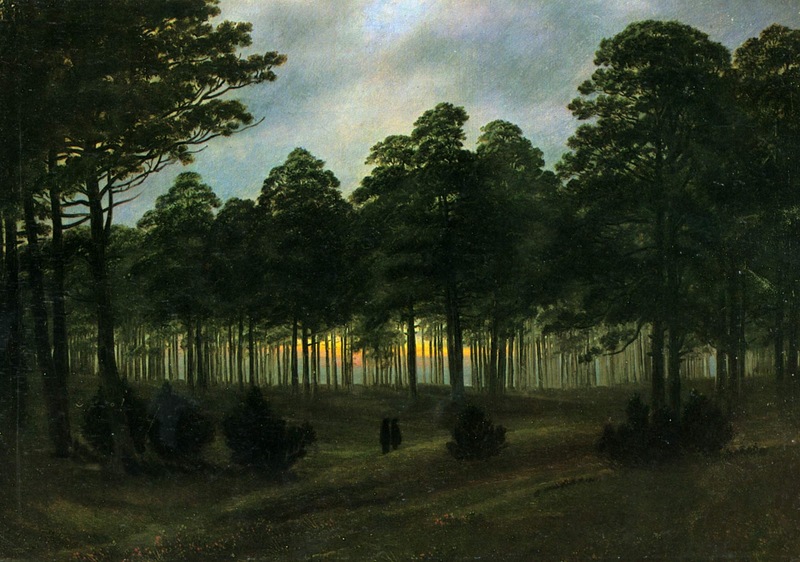 In his 1809 commentary on the painting, Friedrich compared the rays of the evening sun to the light of the Holy Father. That the sun is sinking suggests that the time when God reveals himself directly to man is past. 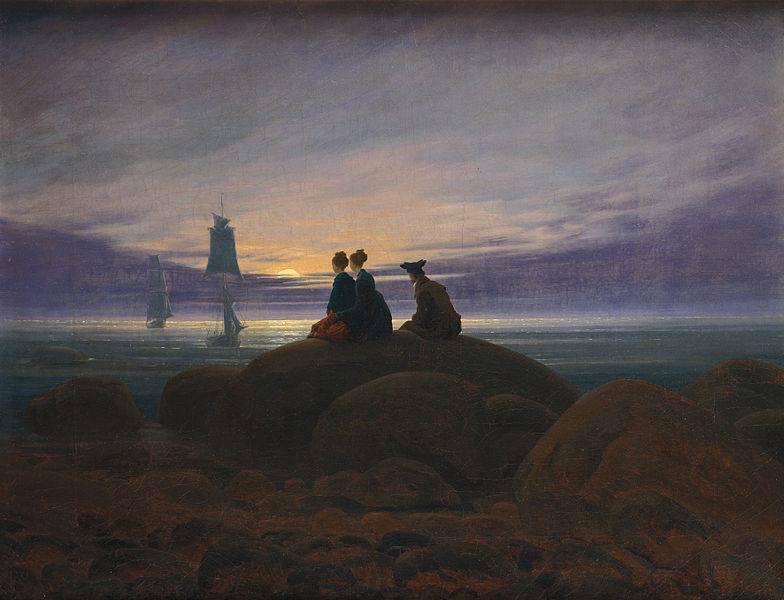 Friedrich's extended interpretation of his own work was the first and last of its kind. His recognition as an artist began with an 1805 prize at a Weimar competition. 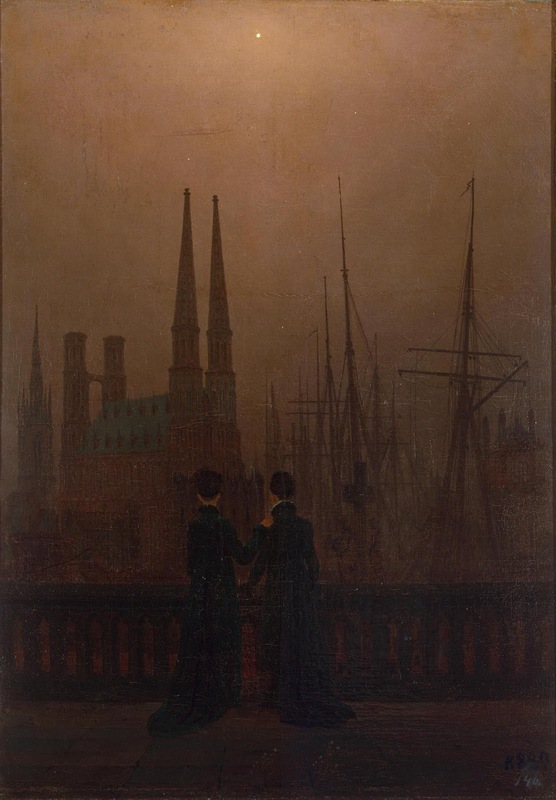 In 1810, Friedrich was elected a member of the Berlin Academy after the purchase of two of his paintings by the Prussian Crown Prince. Six years later he was elected a member of the Dresden Academy, a position which carried an annual stipend of 150 thalers. 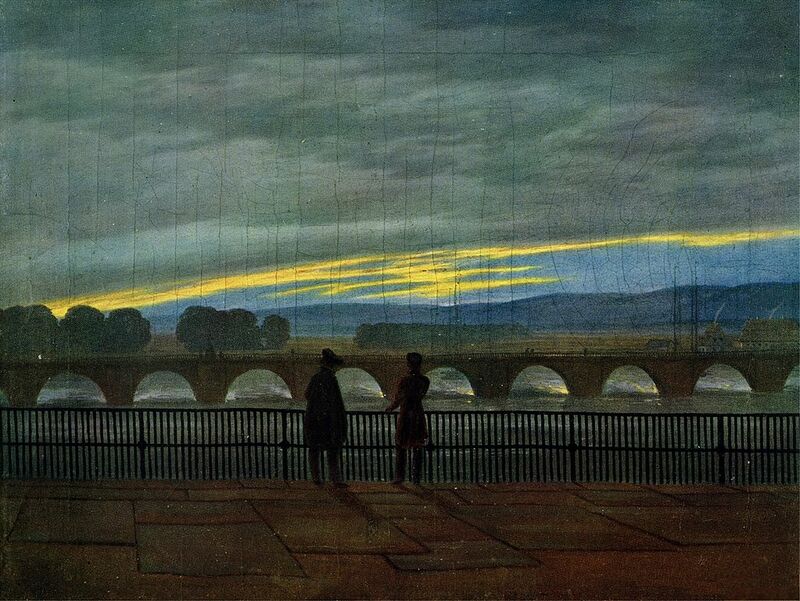 of the Setting Sun (c. 1818). 22 × 30 cm. 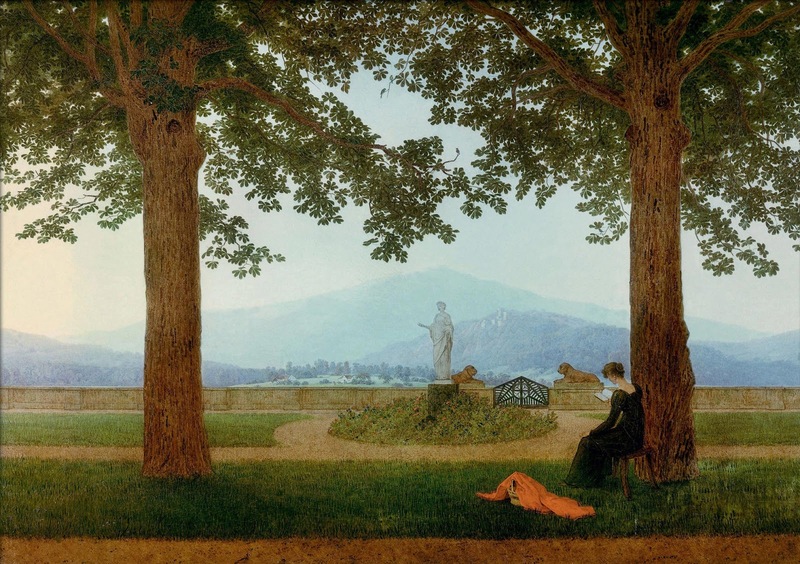 After marriage, Friedrich incorporated larger figures into his canvasses. On 21 January 1818, Friedrich, then 44, married Caroline Bommer. Bommer was twenty-five years old, the daughter of a dyer from Dresden, and a gentle, unassuming woman. The couple had three children, with their first, Emma, arriving in 1820. Carus noted that marriage did not change Friedrich's life or personality, yet his canvasses from this period have new levity. Female figures appear in his work, his palette is brighter, and the dominating symmetry and austerity are lessened. Chalk Cliffs on Rügen, painted after his honeymoon, is a good example of this development. The artist found support from two sources in Russia. The Grand Duke Nikolai Pavlovich visited Friedrich's studio in 1820, returning to Saint Petersburg with paintings for his wife Alexandra Feodorovna. The poet Vasily Zhukovsky, tutor of heir to the throne Alexander II, met Friedrich in 1821 and found in him a kindred spirit. Over many years Zhukovsky helped Friedrich by purchasing his work and recommending his art to the royal family, especially at the end of Friedrich's career, by which time he was poor. 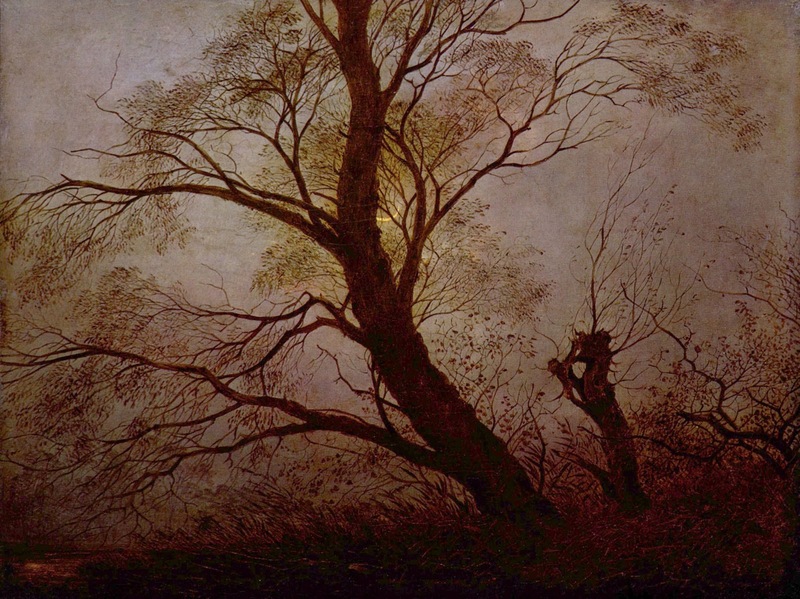 Zhukovsky said that his friend's paintings "please us by their precision, each of them awakening a memory in our mind". 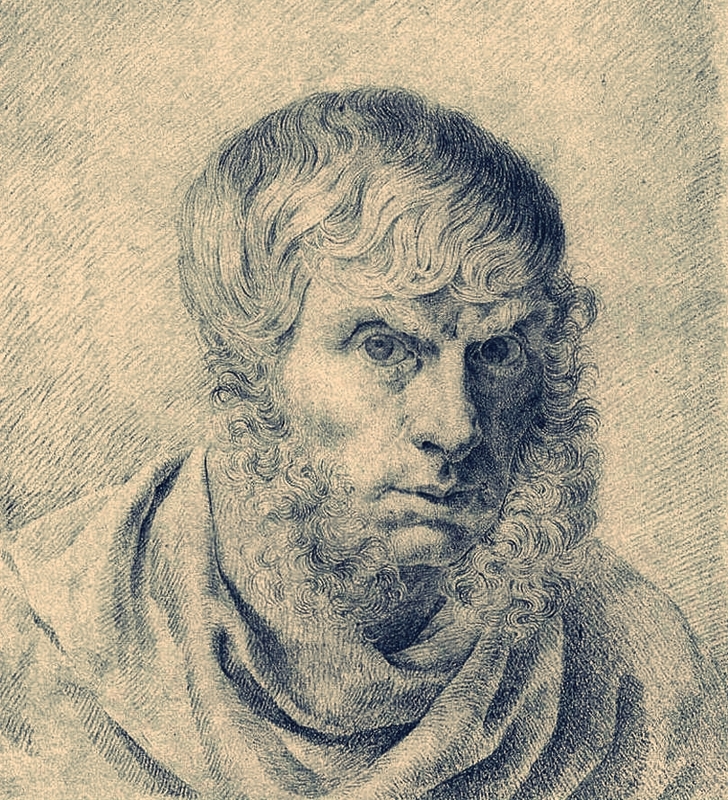 Friedrich was acquainted with Philipp Otto Runge, another leading German painter of the Romantic period, and gained the admiration of the poet Goethe**. He was also a friend of Georg Friedrich Kersting, who painted him at work in his unadorned studio, and the Norwegian painter Johann Christian Dahl**. 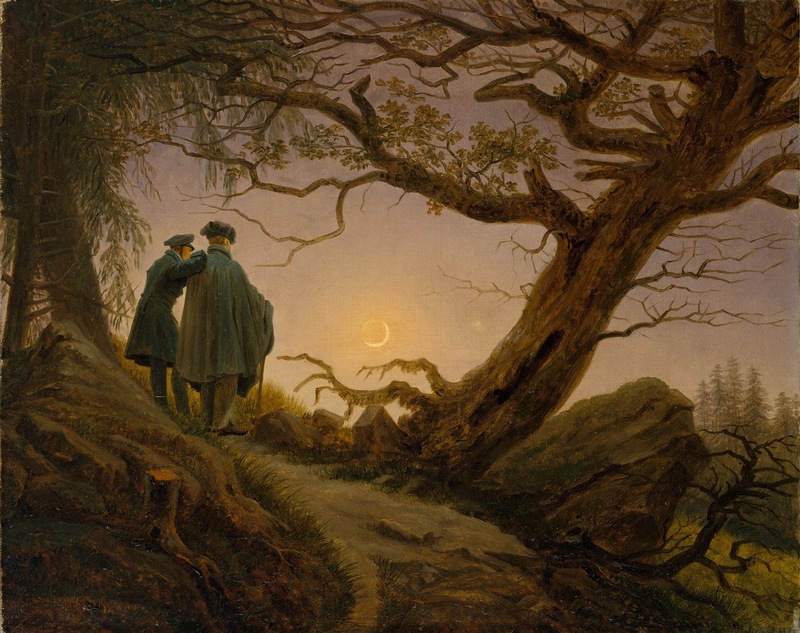 Dahl was close to Friedrich during the artist's last years, and complained that to the art-buying public, Friedrich's pictures were only "curiosities". 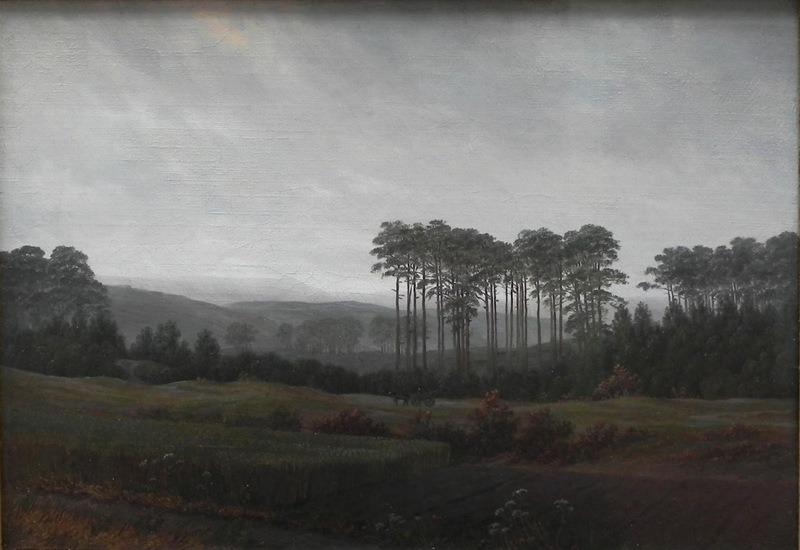 While the poet Zhukovsky appreciated Friedrich's psychological themes, Dahl attended to the descriptive quality of Friedrich's landscapes. "Artists and connoisseurs saw in Friedrich's art only a kind of mystic, because they themselves were only looking out for the mystic ... 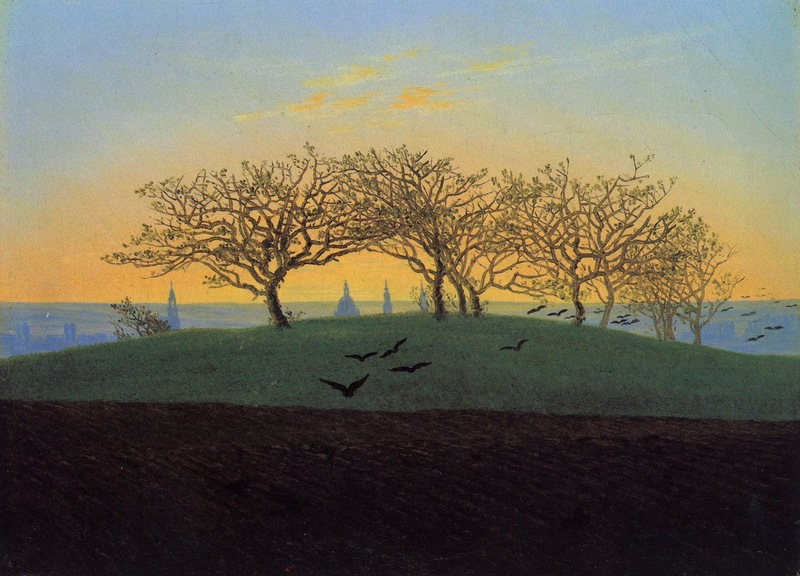 They did not see Friedrich's faithful and conscientious study of nature in everything he represented". In June 1835, Friedrich suffered a stroke that caused some limb paralysis. He took a rest cure at Teplitz, but his ability to paint was greatly diminished. 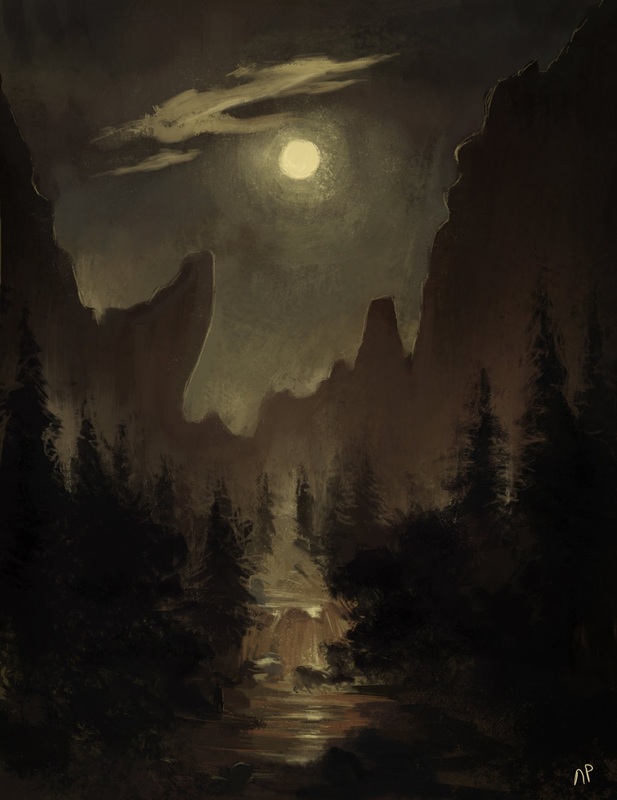 He worked only in watercolour and sepia, and symbols of death appeared heavily in his work, such as a sepia with an outsized owl perched on a grave in front of a full moon. Friedrich fu un artista molto prolifico che produsse più di 500 opere. Conformandosi con gli ideali romantici dell'epoca, il pittore intese i propri dipinti come pure deposizioni estetiche, quindi evitava accuratamente di assegnare titoli troppo prolissi o evocativi. Infatti, è probabile che le opere con titoli più descrittivi, come accade ne Le tre età dell'uomo, siano state ribattezzate in occasione del successo postumo di Friedrich. 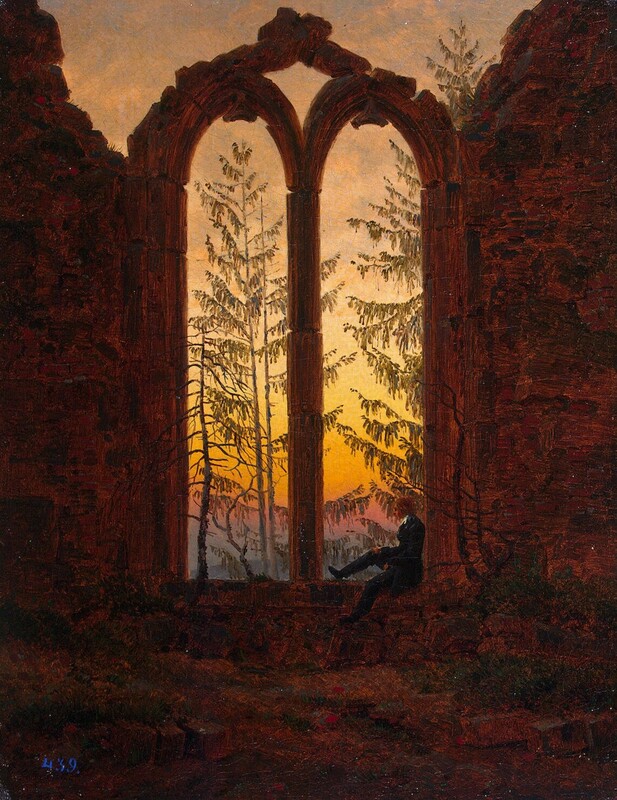 Caspar David Friedrich (Greifswald, 5 settembre 1774 - Dresda, 7 maggio 1840) è stato un pittore Tedesco**, esponente dell'arte romantica. L'artista, uno dei più importanti rappresentanti del «paesaggio simbolico», basava la sua pittura su un'attenta osservazione dei paesaggi della Germania e soprattutto dei loro effetti di luce, permeandoli di umori romantici. Egli considerava il paesaggio naturale come opera divina e le sue raffigurazioni ritraevano sempre momenti particolari come l'alba, il tramonto o frangenti di una tempesta. 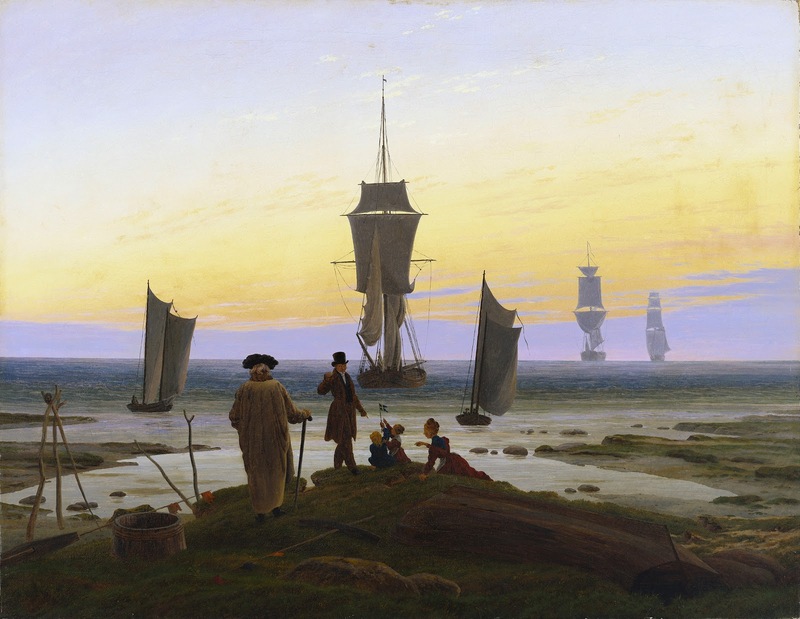 Caspar David Friedrich nacque il 5 settembre 1774 a Greifswald, cittadina della Pomerania svedese affacciata sulla costa baltica. 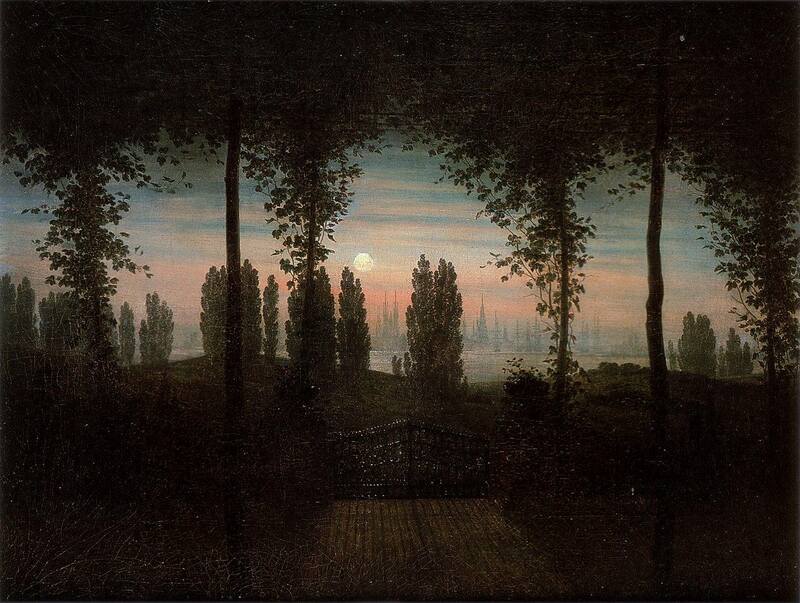 Friedrich era il sesto dei dieci figli di Adolf Gottlieb Friedrich, un fabbricante di sapone e di candele che abbracciava il luteranesimo, e di Sophie Dorothea Bechly, che morì il 7 marzo 1781, quando il figlio aveva solo sei anni. L'anno successivo Friedrich perse la sorella Elisabeth, mentre una seconda sorella, Maria, soccombé al tifo nel 1791. In ogni caso, la tragedia più grande della sua infanzia avvenne nel 1787, quando si ruppe la lastra di ghiaccio su cui stava pattinando, cadde nelle acque gelide. 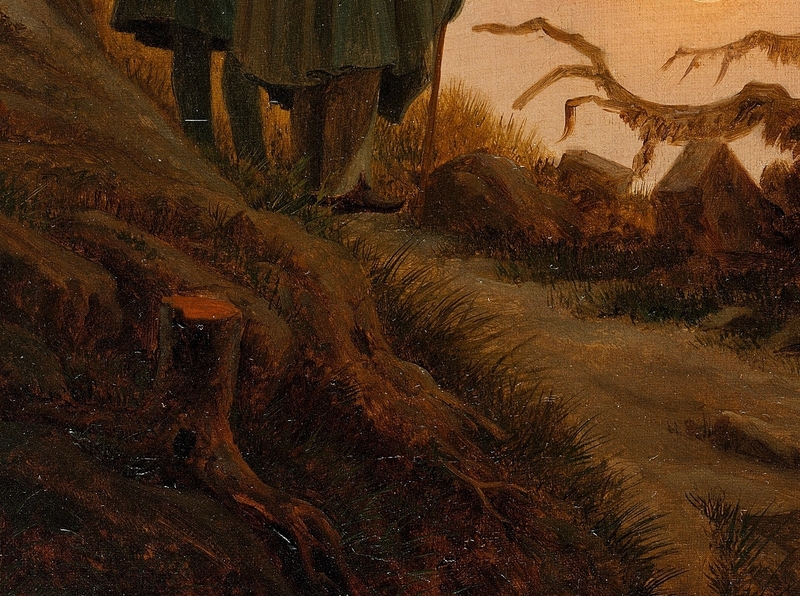 Il fratello, Johann Christoffer, si buttò per aiutare Friedrich; riuscì a salvarlo, ma egli morì, sprofondando nell'acqua, come suggeriscono alcune fonti. 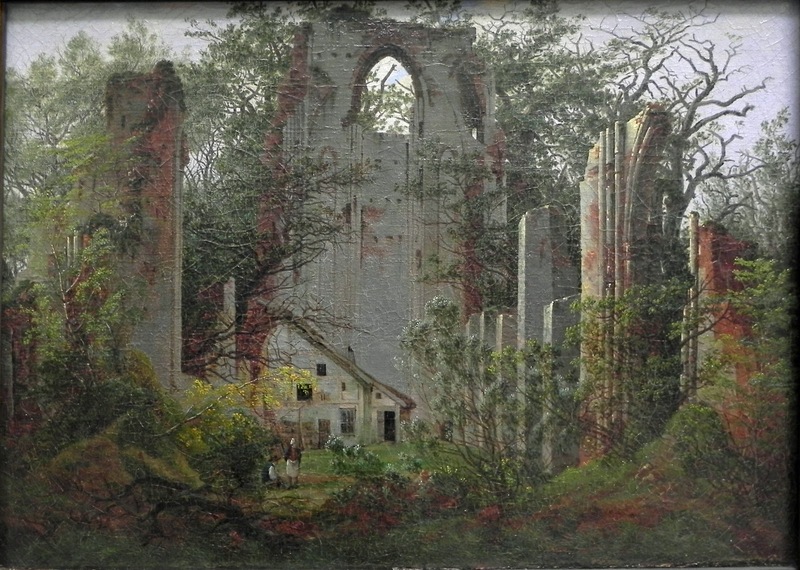 Friedrich fu introdotto all'esercizio della pittura nel 1790, sotto la guida dell'artista Johann Gottfried Quistorp all'università di Greifswald, la cui facoltà di arte prende oggi il nome proprio di Caspar David (Caspar-David-Friedrich-Institut). Quistorp era solito portare i propri studenti all'aperto; di conseguenza, Friedrich fu incoraggiato a prendere ispirazione dalla natura ad una giovane età. Tramite Quistorp, Friedrich strinse importanti amicizie: in particolare, conobbe il teologo Ludwig Gotthard Kosegarten, che gli insegnò che la natura era una manifestazione di Dio, e Adam Elsheimer, le cui opere si incentravano sulla raffigurazione di paesaggi notturni o di soggetti religiosi dominati dalla natura. In questo periodo, intraprese anche lo studio della letteratura e dell'estetica, con l'aiuto del precettore Thomas Thorild. Quattro anni dopo, Friedrich iniziò gli studi alla prestigiosa Accademia d'Arte di Copenaghen, la più importante dell'Europa settentrionale, dove esercitava le proprie doti pittoriche attraverso la copia di statue antiche. Nella capitale danese gli furono aperte le porte dello Statens Museum for Kunst, dove aveva accesso all'importantissima collezione dei dipinti paesaggistici olandesi del Seicento. Ebbe come insegnanti Christian August Lorentzen e il paesaggista Jens Juel, fautori dello Sturm und Drang e punto d'incontro fra gli intensi troni tragici del Romanticismo e la temperie neoclassica, allora predominante. Una grande influenza sul giovane Friedrich fu esercitata anche dal mito islandese di Edda e dalla mitologia norrena. Nel 1798 Friedrich si stabilì permanentemente a Dresda. Durante questo periodo si cimentò nelle incisioni con le acqueforti, e negli intarsi. Nel 1804 si contano 18 acqueforti e 4 intarsi, distribuiti solo agli amici più stretti; ciononostante, l'attenzione di Friedrich fu rivolta principalmente agli acquarelli. Con poche eccezioni, fra cui il Paesaggio con tempio in rovina (1797), preferì non dipingere oli su tela prima dell'affermarsi definitivo della propria reputazione artistica. Friedrich tendeva a rivolgersi alla raffigurazione di paesaggi, con i quali veniva spesso a contatto durante i viaggi che fece in Boemia, nei monti dei Giganti e nello Harz. Qui aveva l'opportunità di dipingere foreste, colline, porti, albe e altri elementi comunque correlati alla natura; nelle sue prime opere, emergono soprattutto paesaggi tedeschi, come le scogliere di Rügen, i dintorni di Dresda e il fiume Elba. La particolarità dei quadri di Friedrich sta nella sapiente gestione della luce, raffigurata con un'eccezionale intensità, mai vista prima. 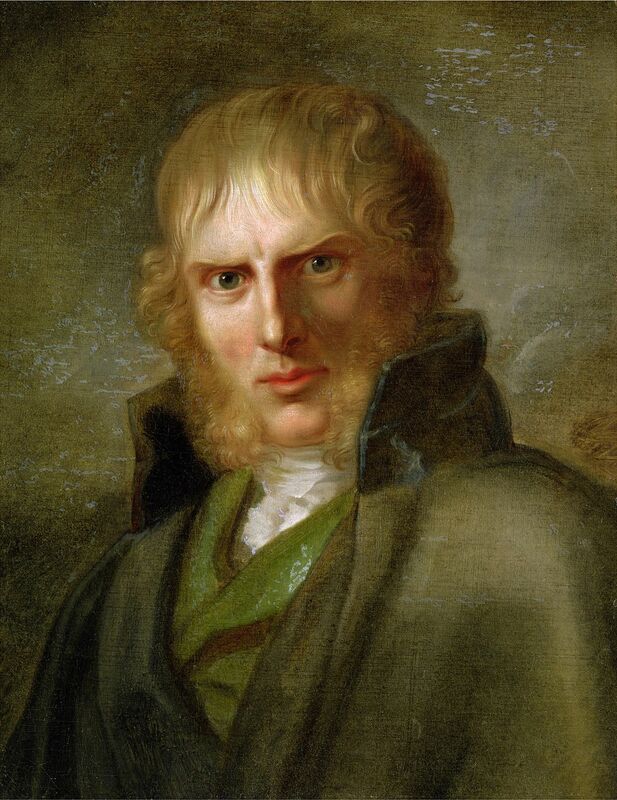 Friedrich si affermò come artista quando nel 1805 vinse il primo premio a un concorso a Weimar, presieduto dal celebre Johann Wolfgang von Goethe**. Sino ad allora quel concorso aveva proposto solo artisti mediocri, che cercavano inutilmente di sintetizzare il neoclassicismo con dei presunti stili greci. 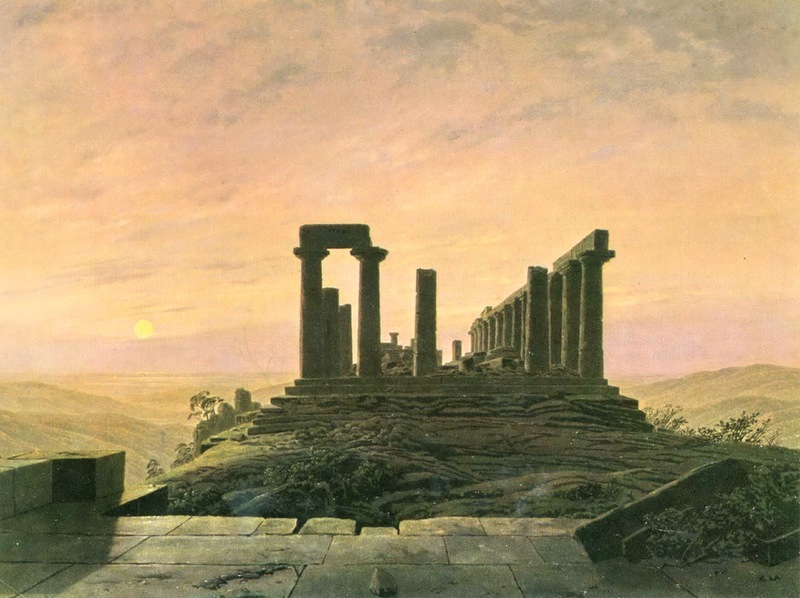 Friedrich completò la prima delle sue opere maggiori nel 1807, all'età di 34 anni. La Croce in montagna, oggi nota come Tetschen Altar (Galerie Neue Meister, Dresda) è una pala d'altare commissionata dalla Contessa di Thun per la cappella di famiglia a Tetschen, in Boemia: fu una delle poche commissioni procuratasi dall'artista. L'opera raffigura una montagna coperta d'abeti e sormontata da una croce, sulla quale era crocifisso il Cristo. La croce, pur raggiungendo il punto più alto del piano pittorico, è presentata da un punto di vista distante ed obliquo. Si tratta di una notevole presa di distanza dai canoni occidentali, dove mai si era vista una simile sinergia fra il tema religioso e la natura. Secondo la critica d'arte Linda Siegel, la pala d'altare è «il logico climax di vari disegni precedenti dove veniva inserita la croce in un'ambientazione naturale». La Croce in montagna fu mostrata al pubblico per la prima volta il 25 dicembre 1808. Nonostante un'accoglienza molto fredda, fu comunque il primo dipinto di Friedrich ad avere una grande pubblicità. I critici si divisero in due: chi, come gli amici di Friedrich, rimase affascinato dalla suggestiva resa dell'opera, e chi criticò apertamente l'utilizzo dei canoni paesaggistici in un contesto simile. «sarebbe una vera e propria presunzione, se la pittura di paesaggio dovesse intrufolarsi nella chiesa e insinuarsi sull'altare». Per controbattere alle critiche mosse da Ramdohr, Friedrich redasse un documento dove rese esplicite le proprie intenzioni: paragonò i raggi del Sole serale alla luce di Dio Padre. Questa dichiarazione rappresenta l'unica volta in cui Friedrich ha registrato un'interpretazione dettagliata del proprio lavoro. Friedrich divenne nel 1810 membro dell'Accademia di Berlino; nello stesso anno, il principe ereditario prussiano acquistò due dei suoi dipinti. Nel 1816, tuttavia, l'artista decise di prendere le distanze dalla Prussia, applicandosi nel giugno dello stesso anno per la cittadinanza sassone. Si trattava di una mossa azzardata, in quanto la Sassonia era favorevole alla Francia, mentre i dipinti di Friedrich erano generalmente visti come patriottici e anti-francesi. Ciononostante, grazie anche all'aiuto dell'amico di Dresda Graf Vitzthum von Eckstädt, Friedrich ottenne non solo la cittadinanza, ma divenne anche un affiliato dell'Accademia Sassone, con uno stipendio di 150 talleri all'anno. Nonostante l'ambizione al professorato, Friedrich non riuscì mai ad ottenerlo, in quanto «si è ritenuto che la sua pittura fosse troppo personale, il suo punto di vista troppo individuale per servire come un esempio proficuo agli studenti». Probabilmente anche la politica giocò un ruolo di primo piano nello stallo della carriera dell'artista: Friedrich raffigurava principalmente luoghi e costumi tedeschi, in circostanze che mal gradivano atteggiamenti non favorevoli alla Francia. «l'importanza della vita umana, ma soprattutto della sua famiglia, inizia ad occupare i suoi pensieri; i suoi amici, sua moglie, e i suoi compaesani iniziano quindi ad essere i protagonisti delle sue opere». Se pure Carus scrisse «che la sua vita non è cambiata in nulla» col matrimonio, il 1818 fu tuttavia un anno di notevole incremento della sua attività artistica e, in particolare, della creazione di due notissimi dipinti: il Viandante sul mare di nebbia e Le bianche scogliere di Rügen. In questo periodo, tra l'altro, l'artista ricevette supporto da due eminenti personalità russe: si trattava di Nicola I e della moglie Carlotta di Prussia, che nel 1820 visitarono l'atelier di Friedrich tornando a San Pietroburgo con un vasto numero di suoi dipinti. Si trattava dell'inizio di un acceso patrocinio, che si sarebbe protratto per numerosi anni. 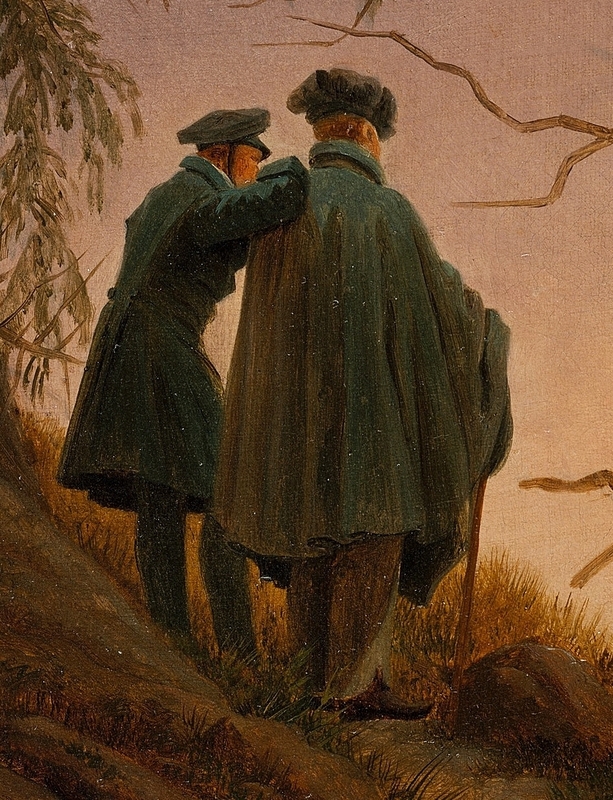 Non molto tempo dopo, Friedrich ebbe dei rapporti con il poeta Vasilij Andreevič Žukovskij, tutore di Alessandro II; Zhukovsky aiutò non poco l'artista, facendo da intermediario tra il pittore, giudicato di «spirito fine», e la corte zarista, alla quale suggeriva i suoi dipinti. Il poeta apprezzava sinceramente le opere di Friedrich, considerandole «belle per la loro precisione e per la loro capacità di risvegliare ricordi sopiti nelle nostre menti». Friedrich strinse altri importanti amicizie: oltre a Philipp Otto Runge (1777-1810), altro pioniere del Romanticismo tedesco, frequentò artisti del calibro di Georg Friedrich Kersting (1785-1847) e di Johan Christian Clausen Dahl (1788-1857)**. Dahl fu molto vicino a Friedrich durante la sua senilità, tanto che manifestò apertamente il proprio sgomento quando scoprì che le opere dell'artista venivano acquistate soltanto «per curiosità». 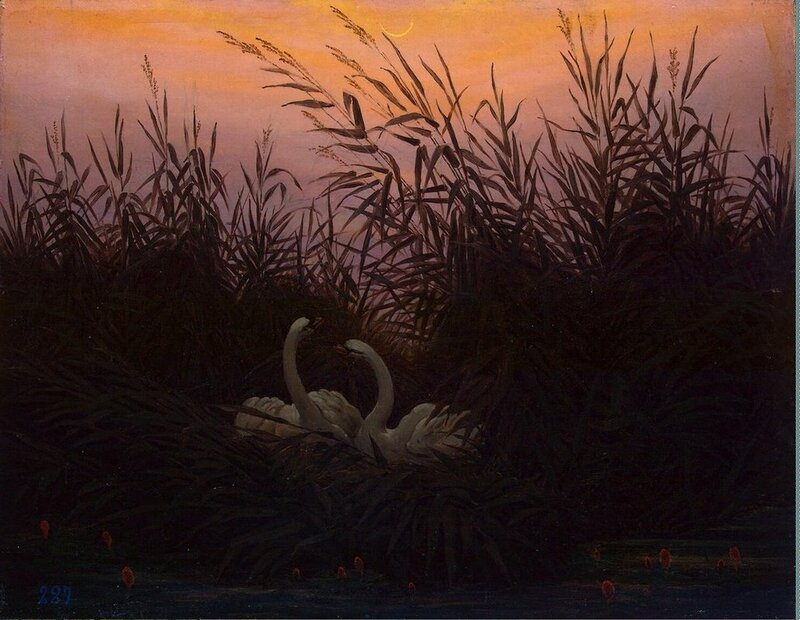 «gli artisti e gli intenditori sono stati in grado di vedere nelle opere di Friedrich solamente l'aspetto mistico, che era l'unica cosa cui stavano cercando... non hanno proprio visto il coscienzioso e fedele studio della natura, presente in ogni elemento raffigurato». La reputazione di Friedrich andò man mano scemando nei suoi ultimi vent'anni di vita. Una volta passati di moda gli ideali romantici, iniziò ad essere considerato come una figura tanto eccentrica quanto malinconica, al di fuori degli ideali del tempo. Gradualmente, i suoi committenti sparirono. Nel 1820, viveva come un recluso, e veniva descritto dagli amici come «il più solitario dei solitari». Nei suoi ultimi anni, la sua situazione finanziaria era disastrosa, e dipendeva esclusivamente dalle elemosine dei conoscenti, la sua salute era in declino. Nel giugno 1835, dopo che fu colpito da un malore, l'artista manifestò i primi sintomi di una malattia la cui precisa natura è rimasta sconosciuta: egli stesso riferisce soltanto di un'indisposizione dovuta al troppo lavoro. L'amico Carus scrisse dopo la sua morte che «si erano venute sviluppando idee fisse, evidente anticipazione della malattia cerebrale alla quale dovrà soccombere, che minarono la sua vita familiare. Essendo diffidente, tormentava sé e gli altri, immaginandosi infedeltà coniugali, in un vaneggiare insensato ma che lo assorbiva completamente». La malattia comportò una diminuzione della sua attività artistica, in particolare della pittura a olio, che egli sostituisce con la meno impegnativa attività all'acquerello e ai disegni a seppia. A testimoniare questo periodo di sofferenza, nelle opere del pittore iniziarono a comparire simboli mortiferi. Secondo i biografi moderni, probabilmente il 26 giugno 1835 Friedrich era stato colpito da infarto o da ictus cerebrale, all'origine della sua patologia; decise di andare a curarsi a Teplitz. Inizialmente Friedrich ebbe un miglioramento che gli diede la fiducia necessaria per poter lavorare ancora e bene; scrisse di sperare di potersi ancora guadagnare, in futuro, il pane quotidiano. Ciononostante, la ripresa si dimostrò essere di breve durata: la malattia lo lasciò debole e depresso. 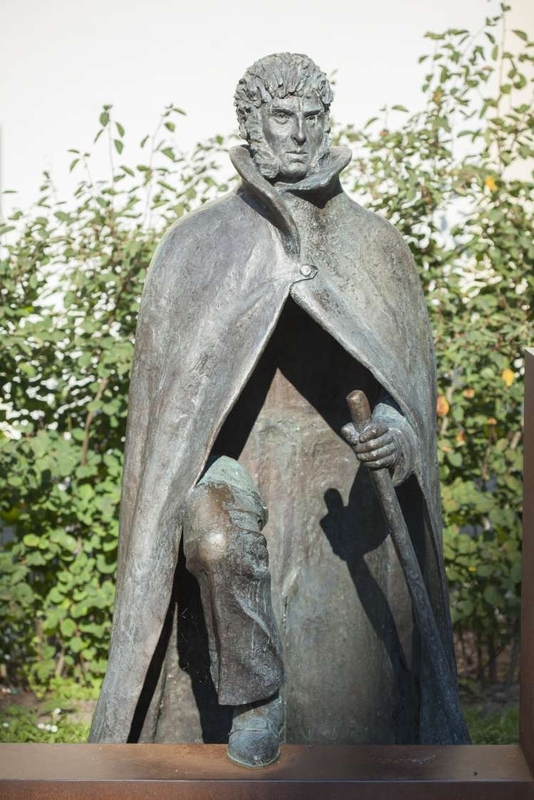 Il 19 marzo 1840 venne visitato dal poeta Vasilij Andreevič Žukovskij, che scelse dei suoi disegni per il granduca Alessandro, in modo da aiutarlo economicamente. Viste le pietose condizioni dell'artista, scrisse sul diario che si trattava di una «triste rovina. Piangeva come un bambino». Friedrich non fece in tempo per ricevere il denaro ricavato dalla vendita dei disegni, poiché morì il 7 maggio 1840 a 66 anni; fu sepolto nel cimitero della Trinità di Dresda. L'innovazione portata avanti da Friedrich si realizzò in chiave paesaggistica: Friedrich intendeva far evolvere la concezione classica di paesaggio, inteso solo come scenario bello da vedere, aggiungendovi il sentimento del sublime, una riunione con il sé spirituale attraverso la contemplazione della natura. L'artista fu un personaggio chiave per trasformare il paesaggio, sino ad allora un fondale subordinato al dramma umano, in un soggetto autosufficiente. 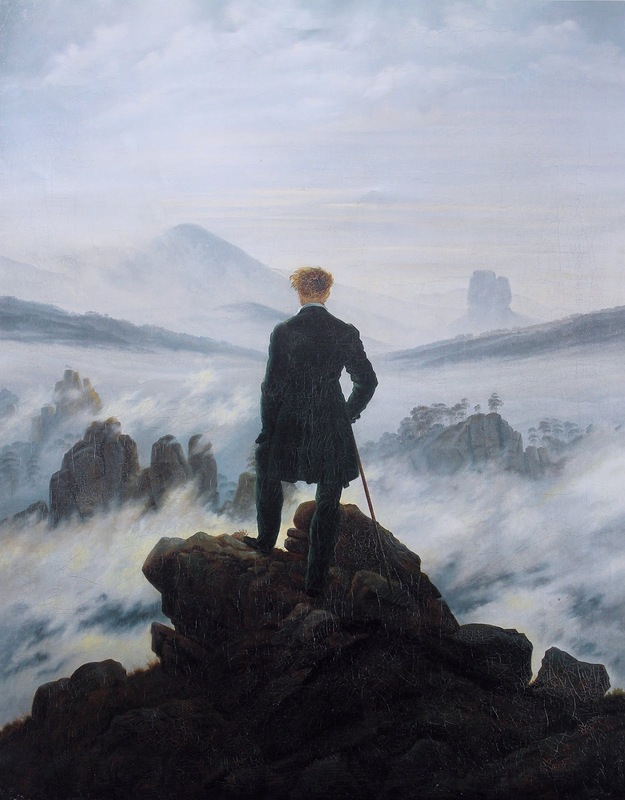 Non a caso i dipinti di Friedrich includono spesso una Rückenfigur, ovvero una persona vista di tergo, assorta nella contemplazione del panorama. L'osservatore, quindi, si identifica nella Rückenfigur, il che significa assimilare il potenziale sublime della natura, che il pennello di Friedrich ricolma di ideali romantici - die romantische Stimmungslandschaft. L'artista paragonò spesso i propri paesaggi a temi religiosi, tanto che molti dei suoi dipinti più famosi sono considerati impregnati di misticismo religioso. Dal punto di vista formale, lo stile di Friedrich abbandona alcuni elementi del modello accademico tradizionale di pittura del paesaggio: l'imitazione della natura, la spazialità razionale, il contorno interno alla rappresentazione, e la varietà dei motivi. Al loro posto troviamo paesaggi stilizzati, atmosfere idilliache o malinconiche, abbinamento di vicinanza e lontananza, ruolo essenziale concesso al vuoto e all'infinito. L'artista non dipingeva all'aperto, ma nel chiuso del suo studio, attingendo le figure dal ricordo e dall'immaginazione; i suoi quadri hanno strutture rigorose, costruite su simmetrie e contrasti tra elementi orizzontali e verticali. «Il pittore non dovrebbe dipingere solo ciò che vede davanti a sé, ma anche ciò che vede dentro di sé. Se dentro di sé non vede nulla, allora eviti anche di dipingere ciò che vede davanti a sé». 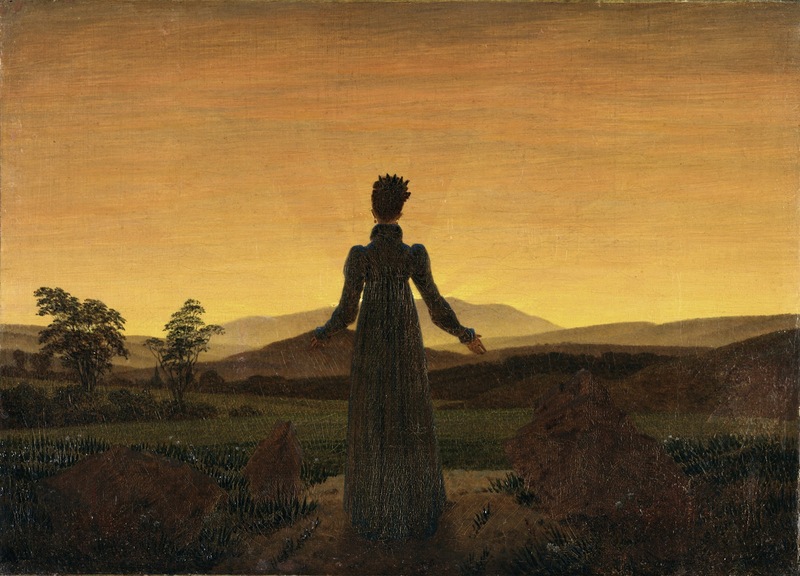 La visione di Friedrich sull'estetica venne messa per iscritto in una collezione di aforismi redatta nel 1830, dove l'artista spiega il bisogno di allineare l'osservazione della natura con una certosina introspezione della propria personalità. «chiudi il tuo occhio fisico, al fine di vedere il tuo quadro con l'occhio dello spirito. Poi porta alla luce ciò che hai visto nell'oscurità, affinché la tua visione agisca su altri esseri dall'esterno verso l'interno». Rifiutava assolutamente l'idea di raffigurare la natura «a tutto tondo», come facevano alcuni suoi contemporanei, fra cui Adrian Ludwig Richter (1803-84) e Joseph Anton Koch (1768-1839). la morte, la caducità, la tomba? Cieli infiniti, tempeste, nebbia, foreste, ruderi e croci sono elementi ricorrenti nei paesaggi del pittore. La morte, tradotta in immagini ad esempio attraverso la raffigurazione di salici piangenti e di barche che si allontanano dalla costa (immagine che, tra l'altro, richiama il mito di Caronte), trova la sua massima espressione nell'Abbazia nel querceto, dove una processione di monaci, intenti a reggere una bara, si dirige verso il cancello di una chiesa in rovina, in uno scenario di funebre desolazione. 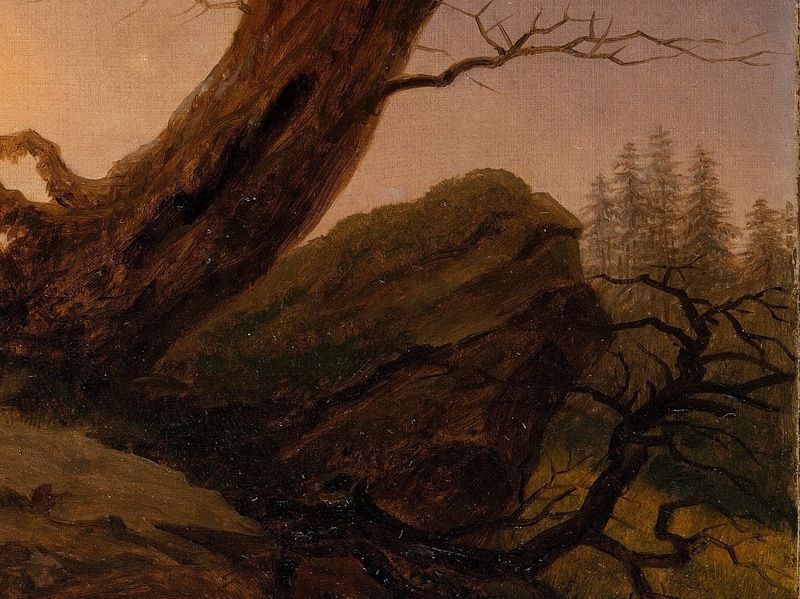 Friedrich è stato anche il primo artista a dipingere la natura invernale come aspra, morta, solenne. 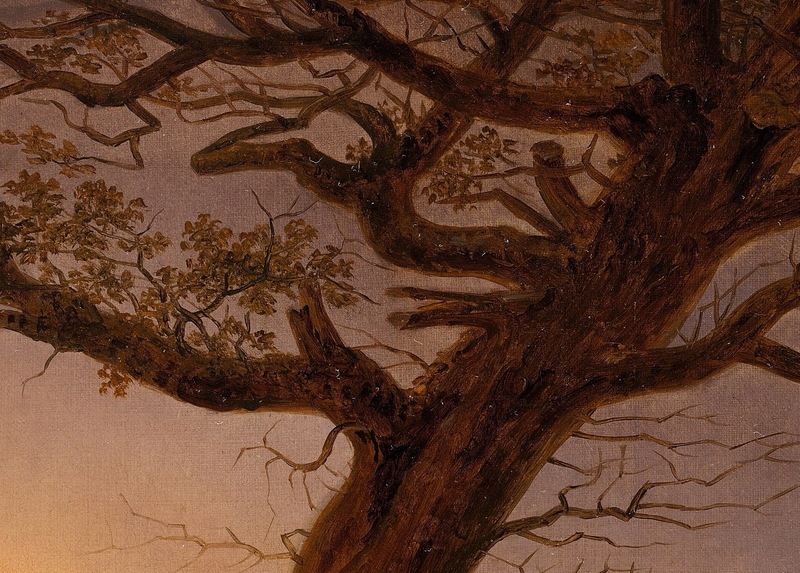 Per indicare la morte, il pittore soleva dipingere querce e tronchi d'albero (come quelli de L'albero dei corvi). Ad affiancare questo simbolismo mortifero vi è però anche il tema della redenzione: la croce e il cielo terso promettono la salvezza eterna, mentre la falce lunare infonde speranza e devozione. La studiosa di letteratura tedesca Alice Kuzniar ritiene che nelle opere di Friedrich emerge un'evocazione temporanea del passare del tempo, concetto quasi del tutto assente nelle arti visuali. Per esempio, nell'Abbazia nel querceto, la processione dei monaci diretta verso il sepolcro riflette il pensiero di Friedrich, secondo cui la destinazione finale di ogni uomo si trova oltre la tomba. Con il passare del tempo, Friedrich iniziò a dipingere prevalentemente albe e crepuscoli, con uno stile fattosi più scuro, più monumentale, più terribile. 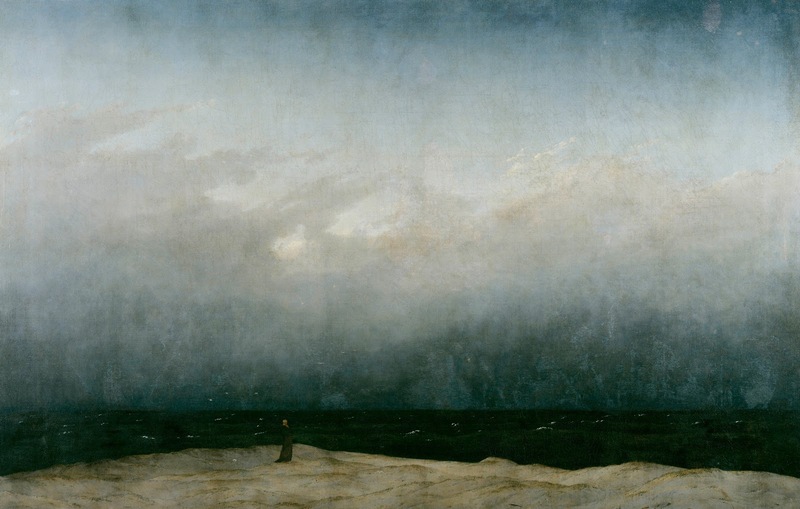 Il mare di ghiaccio è il quadro che sintetizza meglio il pensiero di Friedrich nei suoi ultimi anni. Il dipinto, completato nel 1824, raffigura una scena grama: si tratta di un naufragio nell'Oceano Artico. «L'immagine prodotta, con le lastre di ghiaccio color travertino che inghiottono la nave, precipita dal documentario all'allegoria: la corteccia fragile dell'aspirazione umana, schiacciata dall'indifferenza immensa e glaciale del mondo». Sia la vita che la produzione artistica di Friedrich vengono considerate permeate da un travolgente senso di solitudine. Gli storici dell'arte (ed alcuni dei contemporanei dell'artista) concordano nell'attribuire questa tematica ricorrente ai lutti subiti nella giovinezza, e al misero debutto nel campo artistico. Analogamente, la nozione popolare del «taciturno uomo proveniente dal Nord» fu rafforzata proprio dall'aspetto pallido della figura del pittore. Friedrich soffrì di episodi depressivi nel 1799, 1803-1805, 1813, 1816 e fra il 1824-1826. Anche le sue opere furono permeate dal suo malessere, tanto che vennero introdotte figure quali avvoltoi, gufi, cimiteri e rovine, che divennero poi una presenza fissa a partire dal 1826. Nello stesso anno, si ebbe anche un anomalo mutamento nella tavolozza del pittore, che iniziò ad utilizzare toni più scuri e smorzati. Carus, nel 1929, scrisse che Friedrich in questo periodo «è circondato da una spessa nuvola cupa di incertezza spirituale»; il noto storico dell'arte e curatore Hubertus Gassner, tuttavia, non è d'accordo con tali interpretazioni, vedendo nell'opera di Friedrich un pensiero positivo e di affermazione della vita, ispirato alla Massoneria e alla religione. Quasi a riflettere il suo patriottismo e il risentimento che covava per l'occupazione francese della Pomerania, Friedrich (anti-francese dichiarato) inseriva spesso nelle proprie opere estratti della cultura e della mitologia tedesca. Il sincero amore del pittore per la propria patria si rifletteva anche nei gusti letterari, che vertevano su poesie anti-napoleoniche di Ernst Moritz Arndt e Theodor Körner, e sugli scritti patriottici di Adam Müller e Heinrich von Kleist. Mosso dalla morte di alcuni suoi amici a opera delle truppe napoleoniche, ma anche dal poema di Kleist Die Hermannsschlacht, Friedrich iniziò addirittura a dipingere una serie di quadri dove il messaggio politico veniva trasmesso esclusivamente per mezzo del paesaggio - tecnica del tutto nuova nella storia dell'arte. Il dipinto Tombe di antichi eroi (1812), intriso per l'appunto di alti sentimenti verso la patria, è un'aperta denuncia all'occupazione napoleonica, rappresentata dai due soldati francesi che sorvegliano l'ingresso della grotta. La tomba in primo piano reca il nome di Arminio, quasi per indicare che i soldati d'Oltralpe sarebbero stati sconfitti proprio come le truppe dei Vari, annientate dal condottiero Arminio. Anche il Cacciatore nella foresta (1813 circa) è pregno di umori patriottici.